As an educator for over 20 years at college and university level, Dr. Mensah believed in the power of education and the doors it open for those who strived to be educated. He had a depth of wisdom and experience that could not be easily dissuaded and transcend time. In 1985, Dr. Mensah, a Ghanaian American founded the African American Christian Foundation, as he thought of his personal struggle to find a job as a new immigrant with no work experience in the United States. He wanted to help people in similar situation and bring their blight to light. Each year, the Foundation serves over 600 unemployed adults and disadvantaged youth in West Suburban Cook County area with educational grants and employment opportunities. He was uncompromisingly honest when he gave his advice and counsel. 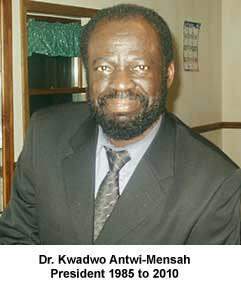 Dr. Mensah stood for principle and exemplified the highest standards of altruism. He was unswerving in his commitment to helping others, unapologetic in his determination to use his influence, and respect to advance the cause of fairness, justice and equality through education. Measured as a chief executive, educator, and champion for equal opportunity, measured by any standard, Kwadwo Antwi-Mensah was a giant among us. He led the organization by precept and example, imploring the organization leadership to never sacrifice principle at the altar of expediency. He was our confident, and our best friend. Our organization owes a permanent debt of gratitude to this warrior, fearless leader, and mentor. In addition to advocacy for job creation within low income communities, in 2013, the organization took on the additional mission to advocate for a thriving Ghanaian community and the organizational preservation of the Ghanaian culture in Illinois in honor of our founder.